In May, we announced custom team helmets for the Hangovers and Arrogant Americans franchises. The helmets were produced by HelmetNation, LLC. Below is an interview with the owner of the business, Aaron Deifel. At the conclusion of the post is a slideshow highlighting the Arrogant Americans helmet from multiple angles. Where are you located? I am located in Stansbury Park, Utah. It is just outside of Salt Lake City. When did you start? HelmetNation was started in 1999. I became the owner in 2007. How did you get started? I have played and/or coached football almost my entire life. I have been fascinated with football helmets since a young age. I started collecting mini football helmets about 20 years ago and when I had a chance to become the owner of HelmetNation, I jumped at it. It is my passion. Have you made a helmet for your own fantasy football team? Unfortunately, given that I coach high school football and have my busiest time of the year in the fall forHelmetNation, I have not played fantasy football in some time. The one or two years I did play, I did not create a team helmet or anything. How many do you typically make in a given year? How long does it typically take? What is the typical pricing? Well, we do thousands of helmets every year for everyone from youth teams to high schools, small colleges, semi-pro, indoor/arena leagues, all types of businesses and, of course, fantasy football enthusiasts. Typical production and delivery time is 3-5 weeks and with a minimum order of 10 the cost is $19.95 for the Schutt XP mini helmet and $24.95 for the Riddell Speed mini helmet. Do you typically get very detailed instructions or are you sometimes given artistic license when making helmets for fictional teams? For most orders we are trying to replicate helmets that are being worn by a team somewhere. In addition, for the businesses I get orders from, they usually have a specific idea in mind. Typically, the most creative requests come from fantasy football guys. Unfortunately, that can be difficult at times to replicate on a football helmet but we have done pretty well over the years. Any weird stories? e.g. any odd requests, etc. As I am sure you are aware, there are some unusual names and logos for fantasy teams out there. I have done a few of them. What was the design parameters for the Arrogant Americans helmet? The Arrogant Americans owner was very detailed in his design request. 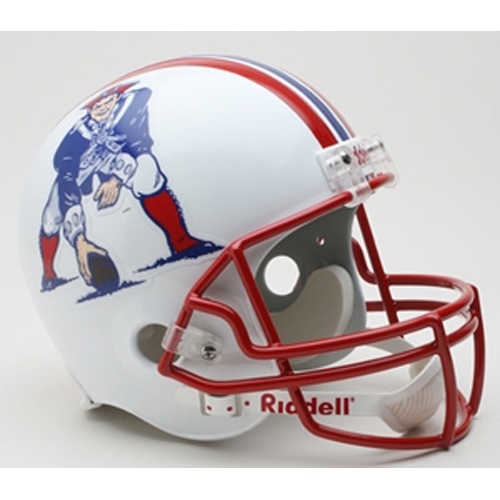 He had an established logo, and he wanted to model the helmet on the throwback New England Patriots design. I think it turned out really well. Were the design parameters constraining or allow you to focus on getting it right? It wasn't constraining at all. It let me know exactly what was wanted and allowed me to get it right. What was the process? We get the design details from the customer, get the order paid for, and get it into production. We send the artwork over to our decal supplier, and if need be order helmet shells/masks for the order. Once the decals arrive from the supplier, we assemble the helmet and ship it to the customer. How detailed was this helmet compared to other fantasy football helmets? Both of these helmets were fairly typical when compared to other fantasy football helmets I have done. Below is a slideshow of the finished product. For a custom mini-helmet of your own, contact Aaron Deifel at HelmetNation.com.